> This team simply can’t lose. The Brewers once again pulled off the improbable, rallying in the ninth inning to defeat the Nationals- the best team in baseball- 4-2. Looking at the box score, you probably wouldn’t guess that it was that “improbable” of a comeback- the Brewers were only down by one going into the ninth. But, if you consider how foolish they looked in all aspects of the game during the first eight innings, then it was rather improbable. Edwin Jackson, who for some reason dominates us, once again held off the Brewers for eight stellar innings. He gave up a run on six hits while walking none and striking out six. The only run Jackson gave up was as Jonathan Lucroy home run in the second inning, but that didn’t appear to phase him much. After a bad first inning in which he gave up a two-run bomb to Adam LaRoche, Shaun Marcum probably had his best start since coming off the disabled list. He went six innings while giving up two runs on four hits. He didn’t walk a batter and struck out three. Oh well; the Nats paid a big price for it. Norichika Aoki started the rally with a bunt single. Two batters, after Aoki had reached third base on a passed ball and a sacrifice fly, Ryan Braun tied the game up with an RBI single. After a Braun steal, Aramis Ramirez wasted no time giving the Crew the lead on an RBI double. The Brewers tacked on one more in the inning on Travis Ishikawa’s RBI infield hit. John Axford came on for the ninth, and, unlike his counterpart, nailed down the save. > For some reason, Ishikawa got the start at first base today, despite the fact Corey Hart proved himself relatively healthy yesterday. It’s also worth noting Hart was hitting .545 in his career against Jackson. But that’s RRR logic for you (which, for some reason, I continue getting gas for on Twitter). Ishikawa should have gone 0-f0r-4, but he got lucky on shortstop Ian Desmond’s misplay in the ninth. > Sometimes I wonder if Ed Sedar knows what he’s doing as the third base coach. In the fourth inning, with the Nats ahead 2-1, Ramirez hit a soft liner into center field; not nearly deep enough to score Braun, who was on second base. But “the windmill” was at it again; he sent Braun home, and he was thrown out by center fielder Bryce Harper. Sedar nearly left the time two years ago for a Minor League job for the Astros; I wish he would have taken them up on that. > Jon Morosi brought up a great point on Twitter earlier today that I should have speculated on prior to this: had the Brewers not suffered the Lucroy injury, we could already be ahead of the Cardinals. Not saying that Martin Maldonado didn’t do a great job while Luc was on the DL, but keep in mind Lucroy was hitting .345 before he went on the DL. If that bat had stayed in the lineup all year, this race would definitely be a different story. > The Brewers acquired catcher Yorvit Torrealba from the Blue Jays. Not a major acquisition; probably just so the Brewers have some catching depth down the stretch behind Lucroy and Maldonado. Should the Brewers make the postseason, though, Torrealba would not be eligible for the roster (unless he were replacing an injured player). > The Cubs walked off on the Cardinals earlier today in 11 innings. The Brewers are now 1.5 games back. Yes, this is really happening. > The 3-4-5 guys in the lineup tonight- Braun, Ramirez, and Lucroy- went a combined 7-for-12. > Axford recorded his third consecutive save in as many games. That means he’ll probably be unavailable tomorrow. Gonzalez is shooting to become the first 20-game winner in baseball this year, but the Brewers knocked him around back in Milwaukee earlier this year, so it won’t be easy. > The Brewers acquiring Torrealba gives me an excuse to re-visit this episode: Torrealba literally whacked an umpire in the face during a winter ball game. > Sometime during the game- I can’t remember which inning- Brian Anderson gave us an update on the Reds-Dodgers game. He said the Reds were winning, 1-1. > Last week was an odd week, as far as the rumors for free-agent first baseman Prince Fielder go. First, it was reported that the Nationals said that they weren’t going to bid on Fielder, at least at his current asking price. Then, the Rangers met with Fielder in Dallas (after specifically saying that they weren’t going to be in on him, but I’ll talk more about that later). But, last night, it was reported that the Nationals were still in the running for Fielder. I don’t know about you, but I’m pretty confused at this point. The Nationals are seemingly a good fit for Fielder. They have Adam LaRoche under contract until the end of 2012, and have an option on him for 2013. But, he hit just .172 in 43 games last year before going on the DL. There have been speculations about a possible trade to get rid of LaRoche, hence allowing the Nats to sign Fielder, but it doesn’t appear that anyone wants him. There are also some question marks on whether or not that Nationals are going to contend over the next few years. They have a capable- but injury-prone- rotation in Stephen Strasburg, Gio Gonzalez, Jordan Zimmermann, Chien-Ming Wang, and John Lannan and Ross Detwiler fighting for the last spot. Their bullpen is stellar, headed by Tyler Clippard and Drew Storen. But, there are a lot of questions about their offense, even if they signed Fielder. Ryan Zimmerman and Michael Morse are their only consistent hitters right now, and the rest of their offense is very inconsistent, which is why they were near the bottom of the NL in team batting average. And, in a division where the Phillies, Braves, and Marlins are all expected to be contenders next year, that Nationals chances at the postseason aren’t the best. And then there’s the financial situation. The Nationals are considered a large market team. But, if they sign Fielder, to, say, a deal close to what Albert Pujols got, they could be in financial trouble very soon. They’re already dealing with what could turn into a disastrous deal with Jayson Werth, and a lot of the pitchers I listed earlier will soon be arbitration-eligible and could become much more expensive by the time they become free agents. So, in my opinion, the Nationals signing Fielder could really hurt them financially in the future. Nolan Ryan said the Rangers weren’t going to go after Fielder this offseason, but, in the back of my mind, I knew they’d become contenders for him at some point. 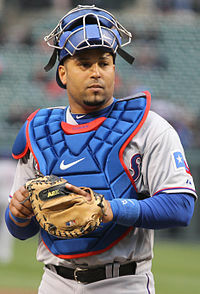 With Mitch Moreland out for the first few months of 2012, Fielder would make sense for the Rangers. And, if they did add him, that would be by far the most devastating lineup in the Majors. But, it’s been said that the Rangers are just using the Fielder discussions as bait to accelerate the Yu Darvish negotations. This is the last week the Rangers can negotiate with Darvish, or else he returns to Japan. The Rangers could just be saying to Darvish, “If you don’t accept this money, fine, we’ll use it somewhere else.” That “somewhere else” being Fielder. > Speaking of Japanese players, it sounds like the Brewers and Norichika Aoki will reach an agreement after all. The Brewers appear to like what they saw at Aoki’s workout in Maryvale, Arizona, and offered him a deal. We’ll have to wait and see if it’s to Aoki’s liking, though. > This has nothing to do with the Brewers, but, the day before yesterday, it was reported that the Mariners and Yankees made a blockbuster trade for two young players with high potential. Pitcher Michael Pineda is headed to New York for catcher Jesus Montero. This gives both the Yankees and Mariners exactly what they needed- the Yankees got pitching to bolster their rotation, and the Mariners finally have some offense after finishing last in runs scored in 2010 and 2011. The Yankees also signed Hiroki Kuroda to a one-year deal, so their rotation is set.